8128 Cad Bane's Speeder is a set released in July of 2010 as part of the LEGO Star Wars: The Clone Wars line. This set consists of 318 pieces, and includes Cad Bane, Shahan Alama, an Elite Assassin Droid, a Senate Commando and a Senate Commando Captain minifigures. It also includes a model of Cad Bane's Speeder, which includes some notable features such as the two flick-fire missiles on either side which also function and the speeder's headlights and the storage compartment in the back. Cad Bane's Speeder is featured in the Clone Wars episode, Hostage Crisis, which take place on the Senate Building, pictured on the box. This set is a special edition and also a Target Exclusive. The set features Cad Bane's Speeder, which has only two main functions, the dual flick-fire missiles on both sides of the vehicle that also act as the headlights, and the large opening storage compartment at the back of the speeder. In the centre of the ship, behind the pilot's seats, are four seats with weapon holders. When the back storage hatch is opened, the engines, also located on the rear of the ship, rotate to face down. The storage compartment in back uses a very large door to cover it, but is not very large nor deep itself. The set has three headlights and two main engines, both of which are located are the rear of the ship. Interestingly, the smaller, attached section of the speeder from the episode which was used to carry Ziro the Hutt is absent from this set. Although being referred to as "Cad Bane's Speeder" by LEGO, the vehicle is actually just a standard airspeeder utilized by Bane to air in his raid on the Senate Building. Bane's actual ship is the Sleight of Hand. Flick Fire Missile in action view. Of the five minifigures included in this set, two of them are exclusive, and two are rare. 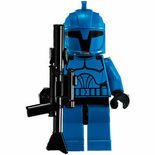 The Senate Commando Captain features the same blue armour as the standard Senate Commandos, but with special white markings denoting him as "Captain". Shahan Alama is also exclusive, and features face and body print similar to that of the pirates included in 7753 Pirate Tank, as he is the same species (a Weequay). Shahan Alama was a Bounty Hunter that worked with Cad Bane. Of the rarer figures, Cad Bane is a bounty hunter, only available in this set and 8098 Clone Turbo Tank, and the other Senate Commando is only available here and in the 2009 8039 Venator-class Republic Attack Cruiser. The Assassin Droid is the standard Elite Assassin Droid also included in the 2009 Battle Pack 8015 Assassin Droids Battle Pack. This set is a model of a standard airspeeder which was a repulsorlift craft distinguished from Landspeeders as having a higher top altitude and speed. Bane used this speeder and one more to orchestrate his attack on the Republic's Senate Building, using one to transport half of his crew, and one to transport the other half. He used these speeders to escape the Republic Army and flee into space under cover from the Separatists. Bane and his cronies linked the two craft together leaving one for them and one for Ziro the Hutt. 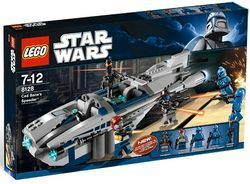 On the box art it says that the set is intended for ages 7 – 12, where as at LEGO.com it says that the set is intended for ages 8 – 14. The Senate Commando Captain and Shahan Alama are exclusive to this set. This is a description taken from LEGO.com. Please do not modify it. (visit this item's product page) Take on dangerous bounty hunting missions with Cad Bane™! Attack the Senate building with notorious bounty hunter Cad Bane™, mercenary Shahan Alama™ and an elite Assassin Droid™! Will the Senate guards see Cad Bane’s Speeder™ and stop this crew from take over? Only you can decide who triumphs! Pull trigger to fire headlight missiles! Open rear hatch of Cad Bane’s Speeder to seat up to 6 minifigures! Facts about "8128 Cad Bane's Speeder"
Take on dangerous bounty hunting missions with Cad Bane™! This page was last edited on 9 February 2019, at 23:02.